Wind Water Pumping by windmills is possibly one of man’s earliest inventions with wind energy historically being used for a wide range of applications, ranging from grinding grain to sawing wood, with many other applications as well. But there are millions of people throughout the world who do not have access to clean water for all of their daily needs. In many of these situations, water is only available from wells or aquifers, but to be usable it must first be pumped from those sources. Stand alone wind based energy systems are an attractive solution to supplying clean electricity to off-grid consumers in remote locations allowing them to be completely independent from any oil price fluctuations. A typical wind energy stand-alone system comprises of: one or more wind energy turbines with its rated power ranging from a few watts to several kilowatts (for micro, mini and small systems) depending on the electricity demand and the available wind potential, and an appropriate energy storage device, generally a lead–acid battery storage array, that is able to guarantee x-hours of autonomy for when the wind does not blow. But as well as supplying large quantities of electricity to charge battery banks, wind turbines can also be used to pump water. The vast majority of wind turbines built in the past have been used for non-electrical applications, and historically, wind water pumps were purely mechanical devices siting high up on top of a wooden tower pumping water for watering livestock, land drainage and irrigation, and as wind turbines do not consume water, it makes them ideal for use in dry or drought-stricken areas. Nowadays, these mechanically driven water pumps are still a good viable option, but with advances in technology there are also a number of other possible wind energy applications that require shaft power as well. These include: wind-electric water pumps and a conventional wind water pump installed in a hybrid power system. The most common type of wind operated water pumping system is completely mechanical. A typical wind water pumping system includes: the wind rotor, a tower, a mechanical pump, mechanical linkage, a well full of water (or other such water source), and piping to deliver the pumped water. Also there maybe some form of water storage as well as the wind water pump. For example, a large water tank, pond, or reservoirs may be used for water storage, depending on the application. The key points to consider in a mechanical wind water pump design includes, designing or selecting the turbine rotor and pump so that the pump size and turbine blade design as well as size, are matched to the total head. Multibladed turbines are available in various diameters ranging from 1.5m up to 5 metres, (6 to 16 feet). water pump shaft diameters ranging from 20mm to 125mm (3/4″ to 5″) for small scale water pumping. It is important to correctly match the rotor blades to the pump because if we were to put a large diameter water pump on a small diameter turbine over a deepish well, at low wind speed the turbine blades may not be able to produce sufficient torque in order to raise the water to the required level. This mainly due to the fact that the pump acts like a brake up to some very high wind speed where the torque becomes sufficient enough for pumping to occur. On the other hand, if we were to put a small diameter pump on a turbine with much larger diameter blades, the pump may only supply a small fraction of the required water capacity we need when the wind resource is available. Also there is a risk of damaging the pump at high wind speeds. Then wind water pumping, by its nature, typically requires fairly high torques and low pump operating speeds. Modern, high tip-speed ratio rotors for generating electrical power have only two or three blades. The conversion of the winds energy into hydraulic energy by a typical wind pumping system requires that the wind speed is greater than about 5-6 mph (9-10 kph), for pumping to occur. Obviously the force of the wind flowing through the blades of the turbines rotor to lift the water will depend upon the weight of the water being pumped and the speed at which the water flows. Then the weight of the water being lifted and the speed at which the water flows will determine the power that must be delivered by the turbine to the pumping system. A deeper well means a higher head height and a heavier load of water which is why many wind water pumping systems use multibladed designs. The vast majority of wind powered mechanically driven water pumps in operation today are of type types of design: reciprocating piston pumps and screw type rotational pumps. For a reciprocating piston pump the turbine is connected to a gearbox and crankshaft which converts its rotary motion into reciprocating up-down motion on a pump rod which is connected to a piston in the pump at the bottom of the well pipe. When the piston is lifted by the piston rod, the piston lifts the entire volume of water above it, and the water flows out of a discharge pipe at the top. At the same time, a slight suction or vacuum is formed under the piston, causing water to flow in under the piston refilling the void. During the next half of the cycle, the piston moves down, causing a piston valve to open, and water flows through into the top of the piston ready to be lifted again during the next half-cycle. The volume of water displaced during each stroke depends upon the piston diameter, which is the same as the diameter of the inside of the cylinder and the length of the stroke. This up-down motion of the piston pump means that the flow of water is not constant but will be inherently pulsating due to this reciprocal action. A much simpler water pump is the spiral screw pump which is based on a long Archimedes screw type design. The main advantages of a screw pump are its simple design, reliability and slow rotation speed making it ideal for high volume heavy duty pumping. Also, driven by the motion of the turbine blades, the screw pump continually rotates producing a constant flow of water at its outlet. The screw pump consists of a fully enclosed pipe extending down into the well and a continuous helix screw which extends for the whole or part of the length of the cylinder, thus forming a lifting chamber. As the screw rotates a small quantity of water is scooped up by the lower blades. The design the screw is such that on the next revolution this water is lifted up to the next blade, whilst the original lower blade scoops up another quantity. Then the head height of the water being lifted is that between the blades. By placing the lower end in water and revolving the screw, water is raised to the top blade by blade. The amount of water pumped will depend upon the diameter of the cylinder and screw, the distance between blades and the speed of rotation. Therefore, the screw pumps efficiency is a function of leakage losses and blade geometry. But as well as the mechanical wind water pump, it is also possible to use a wind turbine generator to pump water, (solar power can also be used to pump water). 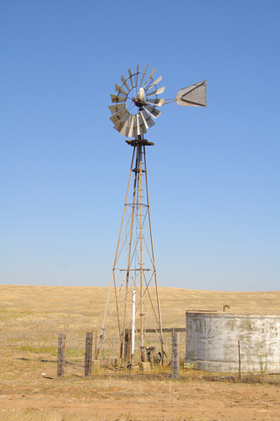 One of the main disadvantages of a mechanical wind water pump is that to pump the water it must be located above or very closed to the water reservoir. However, in the case of wind turbines that supply electrical power to pump water, the wind turbine can be placed far away from the water reservoir, in order to maximize the available wind power at that location. For a typical wind electric water pump, the wind turbine generator used to power the system could be any conventional wind turbine generator used for stand alone off-grid applications. Instead of its generated power being used to charge batteries or power the home, the electrical power can be used directly to supply an electrically driven water pump. Electric water pumps that are plugged into an outlet tend to use alternating current (AC) are of the centrifugal type, driven by a conventional induction motor. Also, the wind turbine generators used in home wind electric applications are typically high speed permanent magnet AC generators supplying 120 or 240 volt power to the home or utility grid. Wind electric water pumping systems are designed to use low voltage 12 or 24 volt direct current (DC) provided by a wind turbine. Instead of using an AC motor to drive the water pump, a DC motor with a voltage and power rating compatible with the DC turbine generator could also be used allowing it to be connected directly to the pump motor. The advantage here is that by only supplying electricity to the load, high starting torque low tip-speed ratio multi-bladed rotors are not required in this type of arrangement. Also, by using a wind electric water pumping system, pressure and/or float switches and possibly some form of microcontroller can be used to switch the water pump on or off when needed as well as for control purposes. With suitable controls, the turbine and pump would operate only when the water was needed or over a range of different pumping speeds. Unlike a mechanical water pumping system which requires the availability of the wind to pump water, an electric wind water pump system could use batteries to store the winds energy so that water could still be supplied even during periods of low wind. A computer controlled wind electric pumping system could even be configured to run a water filtration system to clean the water for domestic use or control one or more pumps from a single wind turbine generator. Wind turbines are well suited for harnessing the power from a renewable energy source. Wind water pumping has the advantage of being an effective low cost efficient solution to ensuring that your water is pumped in an eco-friendly way. The disadvantage of mechanically driven pumps is that they have to be sited above the water resource whereas electrically driven pumps can be sited some distance away from the turbine generator with power being supplied by an electrical cable. The advantage of a wind electric water pumping system is that they can be configured to automatically pump and store water even during periods of no wind. Also being an electrical system, as water demand increases a wind only or a hybrid wind/solar water pumping system can be used. To learn more about a Wind Water Pump and how you can pump rainwater, grey-water, river, pond or well water around your garden for irrigation, or to explore the advantages and disadvantages of using a wind operated water pump as an alternative to using metered tap water, then Click Here today and order your copy from Amazon about how to build a wind powered water pump. To ensure that ample water is always available for livestock, solar powered water pumping systems should incorporate storage sufficient to supply water requirements for three or four days. I am Fritz Zangenberg and I am empliyed by Southern Cross Bloemfontein. We manufacture windmills. Perhaps we can chat sometime? My names are Mumbi im a final year student at a local university located in Kitwe, Zambia studying a Beng(Hons) in Mechanical Engineering. My final year project is designing and fabricating of a wind water pump. Bearing in mind that you manufacture windmills i was seeking your professional advice on how i can go about it.